Win cash, bonuses and points in the Party Casino Magic Key promotion which takes place this May 2015. To win prizes players must play any of the selected online casino games to get a Magic Key that will unlock a prize. Earn only one Magic Key per day during the promotional dates. The big one jackpot has been growing steadily and is almost up to $2,5 million, play daily for your chance to hit the jackpot and claim your magical keys. 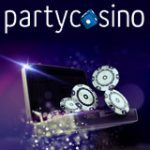 Sign-up to PartyCasino and get your deposit matched 100% up to $750/€750/£750, the Party Casino minimum deposit is only $10/€10/£10. Palladium, Loot'EnKhamun, Fire Drake, Melon Madness, Full Moon Fever, Super Mystic, Festive Fortunes, Sweet Hawaii, Glamour Puss, Jail Break, Mega Fortune, Wheel, The Sting, Dragon's Hoard, Intensive Scare, Golden Oasis, Treasures Of The Deep, Cash Cruise, Shipwreck, Super Joker, Atlantis, Aztec Gold, Kung Food and Fire Drake 2. Two of the selected games Melon Madness and Loot'EnKhamun both feature the Party Casino Big One jackpot which is just waiting to be hit. One lucky winner will soon take home a jackpot prize of $2,5 million. 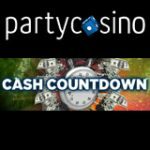 Players can win up to $2,000 in cash, bonuses and points by collecting Party Casino Magic Keys everyday. 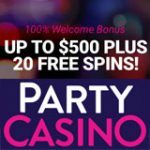 CODEBONUS - 100% up to $750 on First deposit. 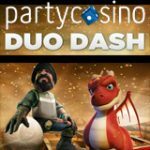 Enter the PartyCasino bonus code on the deposit screen when making your first deposit of at least $10/€10/£10. Eligible players for the Party Casino Magic Key promotion will see the promo available when logging into the lobby. 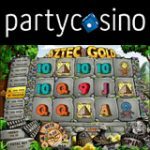 The promo runs from 18-31 May and can be played on either the PC or mobile version of the PartyCasino software. 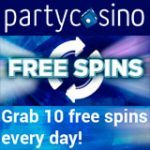 Check your promotions pages in the lobby for Magic Keys after playing any of the selected PartyCasino games during the promotion. Players that receive bonuses must claim the bonus in the lobby under the bonus section. Bonuses will be available for two days and will expire thereafter and any unclaimed bonuses will be forfeited. Complete the wagering requirements to clear the bonus, cashing out the bonus will only be allowed when the requirements have been fulfilled.